Istanbul, Constantinople, Byzantium, The City on Two Continents: no matter what you call it, having the chance to spend 2 days in Istanbul is an opportunity to relish. This city is a place of history, legends, delicious food, and endless tea–it is impressively large, occasionally confusing, and utterly captivating. We have been lucky enough to spend nearly two months living in Istanbul this year, discovering plenty of nooks, crannies, and tasty breakfasts along the way. Based on all of our eating exploring, we’ve put together this complete 2 days in Istanbul itinerary: if you’re headed to Istanbul on a time crunch and are wondering what to do, we have you covered here. Sultanahmet is effectively Istanbul’s old town and is the home of many of Istanbul’s iconic sites: to see the best of Sultanahmet on your first day in Istanbul, you’ll have to get an early start and end up with some achy feet… but it’ll be worth it. Start at the Hippodrome & Egyptian obelisk. 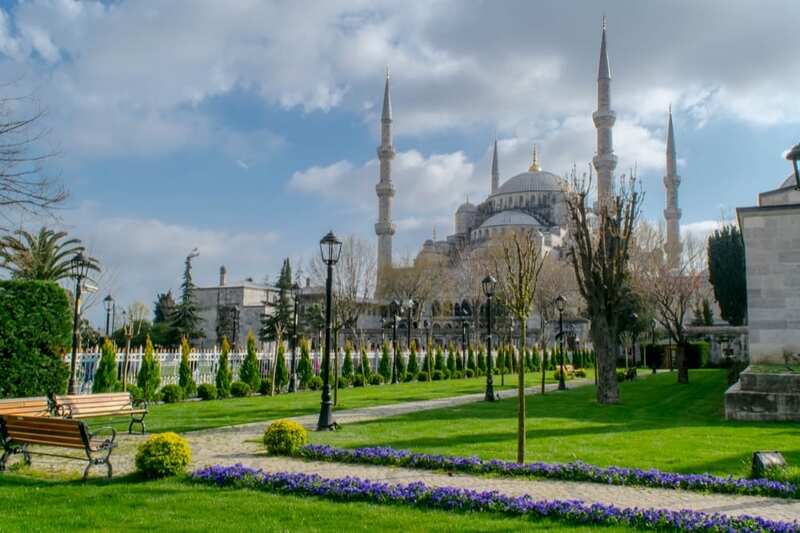 Quirky, historical, and unexpected: there’s no better way to start getting a taste of Istanbul than at the Egyptian Obelisk near the Blue Mosque. 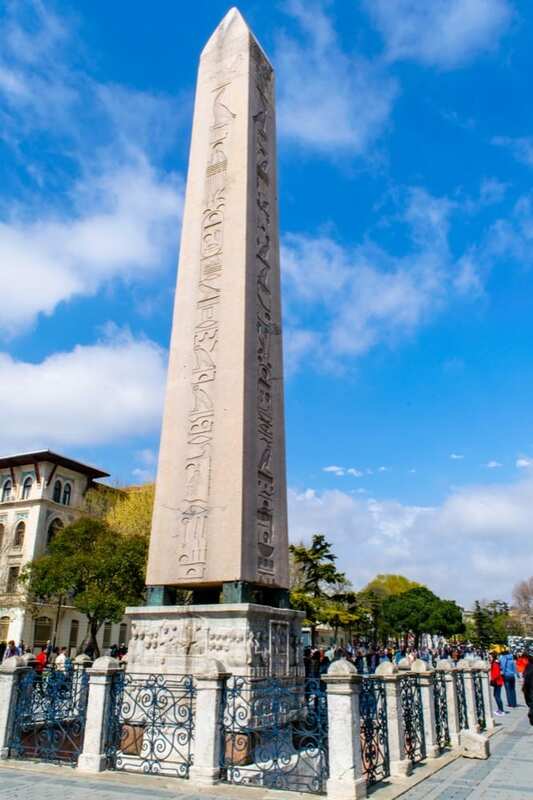 Originally built in Luxor in 1500 BCE, the obelisk was moved to Constantinople around the year 390 (yep–Istanbul history goes back a long time) by the current Emperor… and the giant obelisk you stare up at in Istanbul today is estimated to only be around a third of its original height! You can look down at your feet for more: the public gardens that the obelisk stands in today are what is left of the Hippodrome (aka chariot racing track) that was built in the city nearly 2,000 years ago. Head to the Blue Mosque (Sultan Ahmet Mosque). 1-minute walk from the Egyptian obelisk. 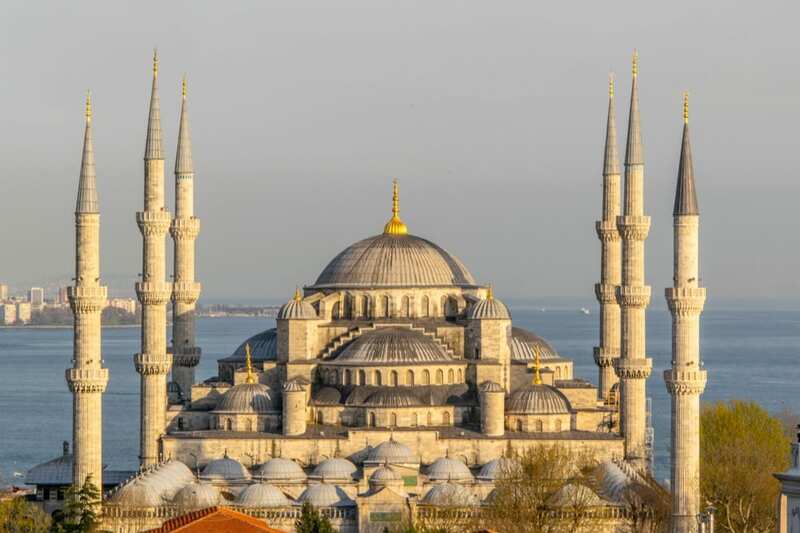 Completed in 1616, the Blue Mosque (which, incidentally, is not actually blue–the nickname comes from the blue tiles in its stunning interior) is easily one of the most famous landmarks in Istanbul. Approaching from the Hippodrome area, you’ll be able to get the full effect of the mosque as you approach: the building is intricate and beautiful inside and out, and you’ll likely find your jaw on the floor at least once or twice while admiring it. The mosque is completely free to enter, though there are three things to be aware of: your dress (more on that below, you’ll need to cover up), prayer times (the mosque closes every day for 90 minutes during each of the five Muslim prayer times), and the crowds. As one of the most famous attractions in Turkey, the Blue Mosque is nearly always crowded–the earlier you can get there, the better (and with only 2 days in Istanbul, an early start is a great idea anyway). Check out the Hagia Sophia. 4-minute walk from the Blue Mosque. First a church, then a mosque, and now a museum for nearly 100 years, the Hagia Sophia is not only insanely beautiful, it’s an impressive piece of world history. The current structure first opened for worship in 537 (nope, not a typo), though the original church on the site was built in 337 (still not a typo) by the East Roman Empire–talk about some long-reaching history! Today, you can admire Christian mosaics alongside Islamic scripts and decor–and while you’re there, don’t forget to look out the windows on the second floor. The view of the Blue Mosque is sensational! 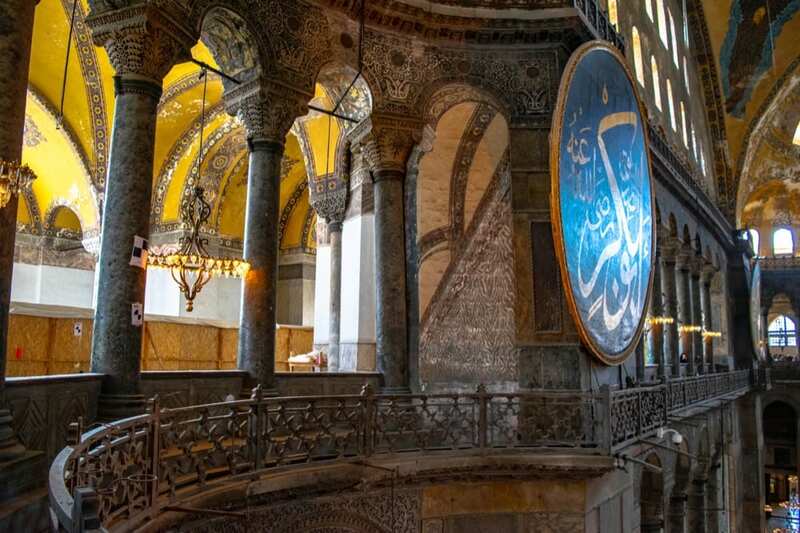 Waiting times can get very long at the Hagia Sophia–with only 2 days in Istanbul, consider skipping the line! 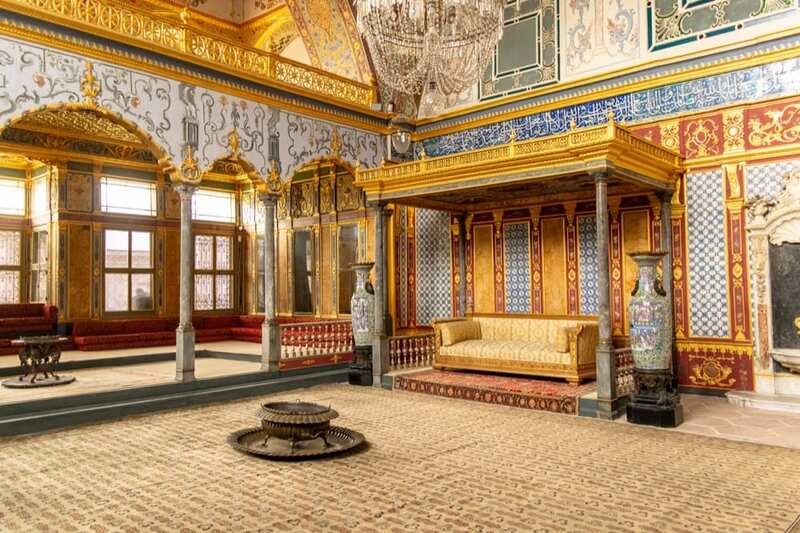 Pay a visit to Topkapi Palace. 3-minute walk from the Hagia Sophia. As the home of around 30 Ottoman sultans over the course of nearly 600 years, Topkapi Palace has certainly seen its share of history. Devastatingly ornate and boasting beautiful views of Istanbul and Bosphorus Strait, Topkapi Palace is worth visiting for the photo opportunities alone (definitely pay the extra nominal fee to tour the harem/living quarters–it’s arguably the prettiest part!). The history, though, is also worth paying attention to–at its peak, the Ottoman Empire controlled large swaths of Eastern and Central Europe, the Balkans, the Caucasus, the Middle East, and North Africa, and it all originated from Istanbul. If you’re looking for some particularly wild artifacts collected throughout the empire, today’s Topkapi Palace has several objects on display that should raise eyebrows: the sword of David, the footprint of Muhammad, the staff of Moses, and the robe of Joseph, among others. Though the legitimacy of these items is somewhat in question (they would, after all, be ridiculously old and well-preserved), the general line of thought is that these particular items were probably already being celebrated by various Christians and Muslims throughout the empire, and that they were brought to Istanbul for the sultan with those identifications–accurate or not–already in place. Regardless–it is a fascinating display. If there’s one place on this 2 days in Istanbul itinerary you book a guided tour for, make it the Topkapi Palace: there is so much history there, and a guide can really bring it to life! 6-minute walk from Topkapi Palace. 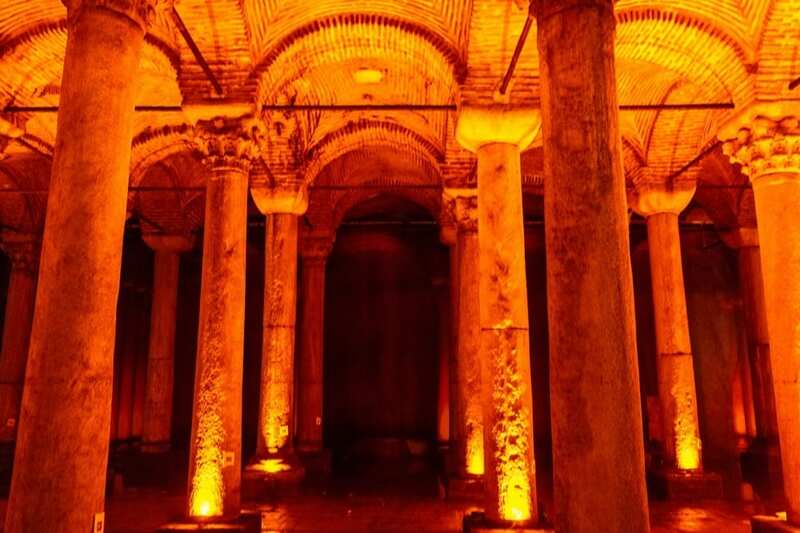 As the largest surviving Byzantine cistern in Istanbul, walking into the Basilica Cistern feels a bit like walking into another dimension: you’re underground, in the dark, and surrounded by beautiful, carefully placed columns (many of which were taken from out-of-use temples during construction in the 6th century). It’s quite the eerie place… minus the crowds of tourists and gaudy photo op at the entrance, that is. Definitely take a moment or two to soak in the atmosphere in a quiet spot–it’s incredible. Also, don’t forget to check out the Medusa heads at the bottom of two columns near the back of the cistern! Their origins remain a bit of a mystery. Stroll over to the Grand Bazaar. 12-minute walk from the Basilica Cistern. Founded in 1461 and nearly constantly busy ever since the Grand Bazaar is one of our favorite places in Istanbul: it’s beautiful, it’s hectic, it’s bursting with color, and it alights each and every one of the senses. If you’re looking for souvenirs, a cup of tea, a Turkish lamp, jewelry, or just about anything else, you can find it here. With more than 4,000 shops covering 60 streets, this is a place that truly has something for everyone. Haggling is absolutely expected here, so come prepared. Shop owners will beckon you into their stores, but we’ve found they’re very quick to listen to a polite “no” (even more so if you crack a joke with them). Some shop owners may ask you to have tea with them–this is perfectly normal and a typical experience in Turkey! It will up the pressure to buy something, so you may want to wait to accept the offer from a shop owner that you plan to purchase from, but you are under no obligation to purchase simply because you accept tea. Step inside the Spice Market. 7-minute walk from the Grand Bazaar. 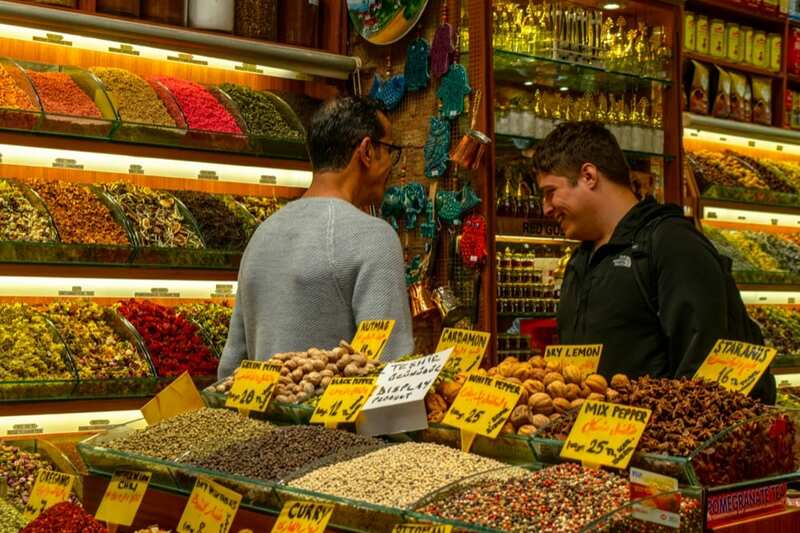 The Spice Market is another one of our favorite spots in Istanbul: it’s beautiful, it smells amazing, and it’s a fantastic place to do a little (edible) souvenir shopping. 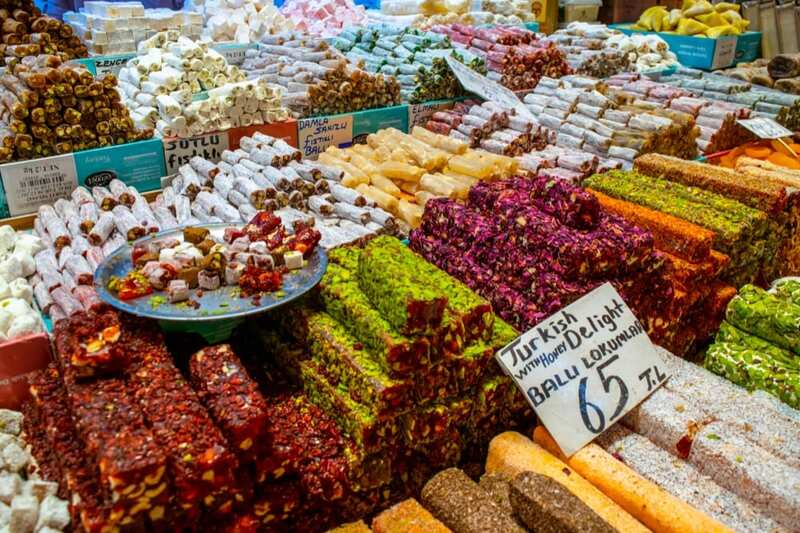 The market isn’t enormous–you can wander through most of it in an hour, even half an hour if you don’t stop much, but be sure not to leave empty-handed: the Turkish delight and baklava alone are worth paying attention to. If you’d like a view from above, there’s a little cafe near the entrance that has a second-floor sitting room–order a cup of tea and enjoy watching the people go by! Start with a Turkish breakfast. The best way to kick off your second day in Istanbul is with a classic Turkish breakfast! Turkish breakfasts are famous for being hearty and delicious, and they definitely live up to their reputation. 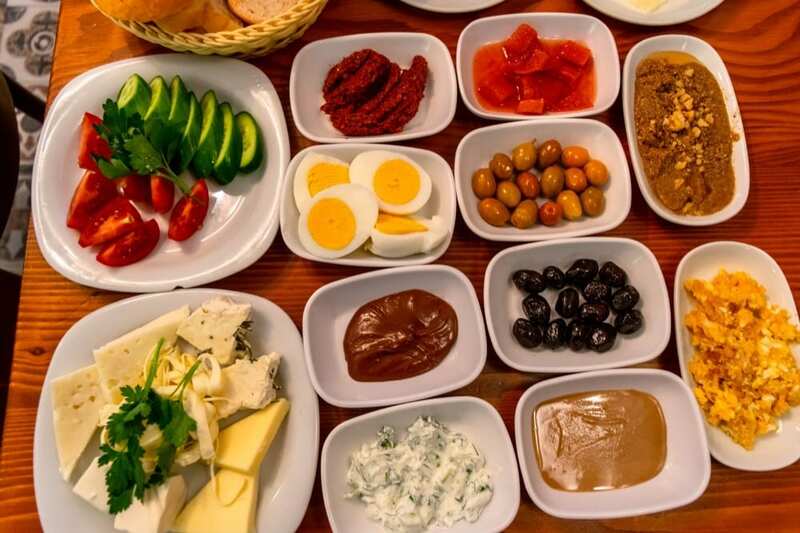 Made up of many different spreads and breads, along with olives, several cheeses, honey served with clotted cream, eggs, and copious amounts of tea, no 2 days in Istanbul would be complete without a full Turkish breakfast. There are tons of great Turkish breakfast spots around the city, but given the Istanbul itinerary for the day, we recommend starting with well-reviewed and popular Van Kahvalti Evi (Kılıçali Paşa Mahallesi, Defterdar Ykş. 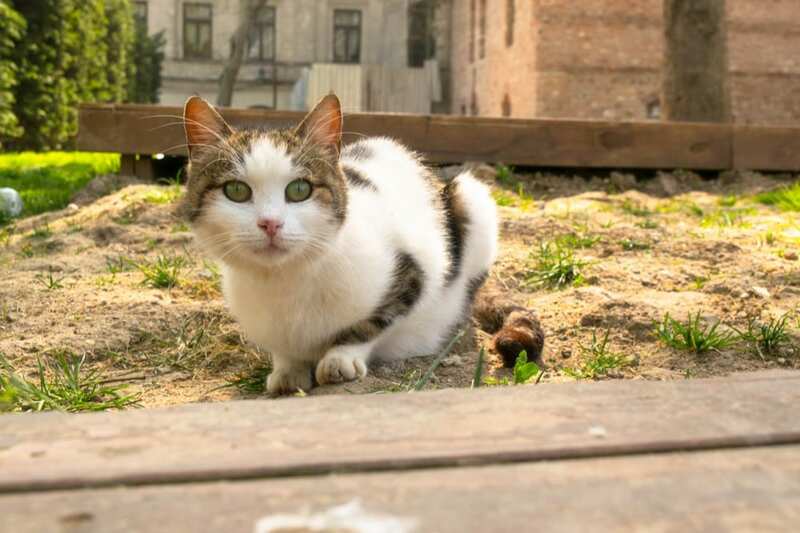 52/A, 34425). You’ll find a great mix of tourists and locals here, along with an excellent breakfast and ridiculously inexpensive prices (especially given the restaurant’s excellent reputation). 10-minute walk from Van Kahvalti. Istiklal Street is the heart of modern Istanbul: a shopping street at heart, it is always crowded with locals and tourists alike. If you’re hoping to shop at some major retailers like Gap, H&M, Sephora, etc, while in Istanbul, this is the place to do it (and the prices are fabulous). Looking for traditional goods and souvenirs? Those are here, too. 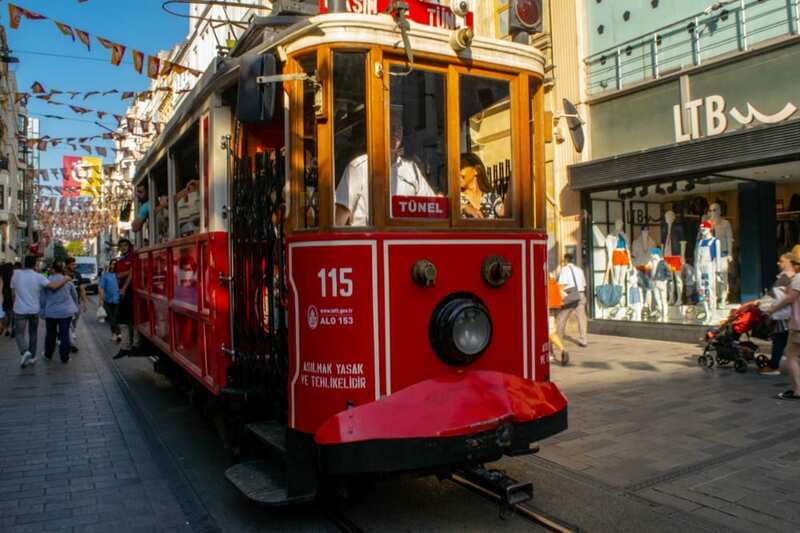 Istiklal is also home to a historic, adorable red tram that runs the length of the road: hop on for an inexpensive ride, or simply enjoy watching it go by, complete with the local kids who tend to literally jump on and off. Pay a visit to Taksim Square. 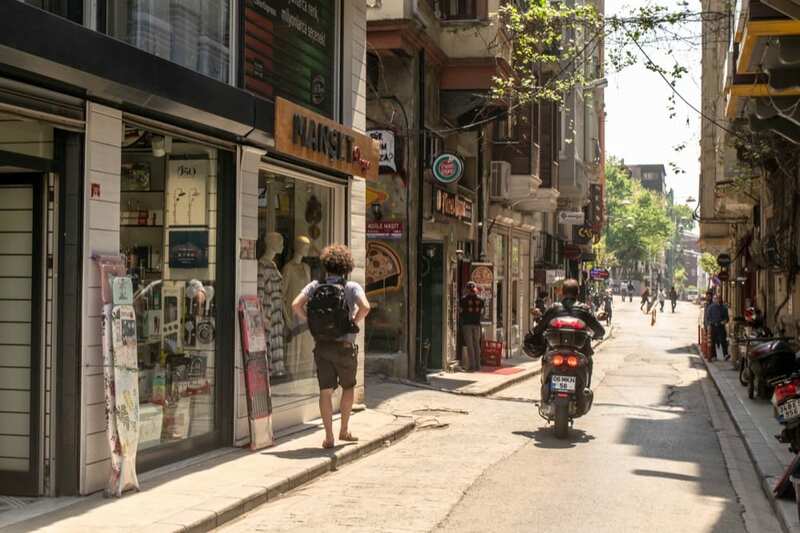 Roughly a 15-minute walk along Istiklal, depending on where you start. Istiklal Street dead-ends into Taksim Square, also known as the center of modern Istanbul. 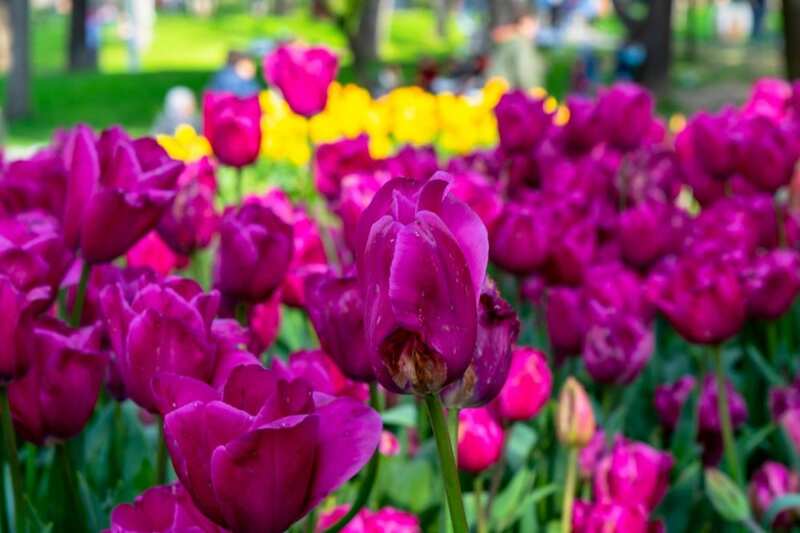 Home to everything from a monument to Ataturk (the founder of the modern republic of Turkey) to tourism companies to thousands of tulips in the spring, Taksim Square is a sight worth adding to your 2 day Istanbul itinerary. Soak in the views from the Galata Tower. 22-minute walk, will include some doubling back along Istiklal. Alternatively, you can get there in 8 minutes using the underground funicular located in the Taksim metro station. Originally built in the 14th century as a watchtower, Galata Tower is one of Istanbul’s best-known landmarks and is home to some of the best views of the city! Climb the tower (an elevator takes you most of the way, so it’s not even strenuous) for beautiful views of Istanbul and the Bosphorus Strait. The neighborhood surrounding Galata Tower is also beautiful, full of cobblestone streets, tiny restaurants, and souvenir shops. Stroll across the Galata Bridge. 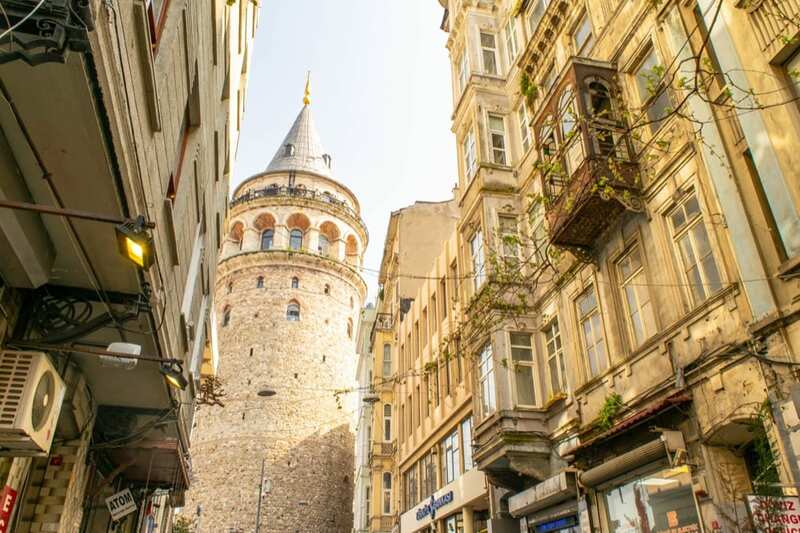 10-minute walk from Galata Tower. From the Galata Tower, make your way to the Galata Bridge: this modern bridge is a must-see during your 2 days in Istanbul and is home to some iconic Istanbul sights. 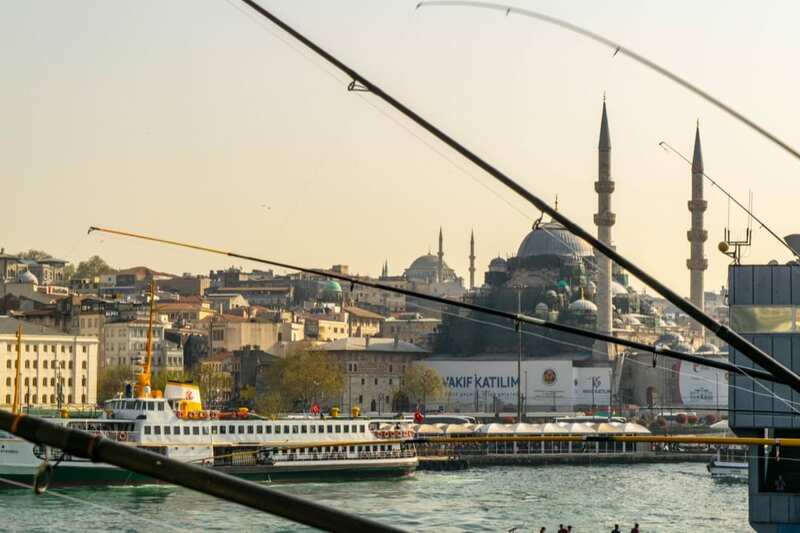 Admire the dozens of fishing poles over the water (it’s a popular fishing spot), the views of the Galata Tower and surrounding area, and then make your way under the bridge, where you can buy one of Istanbul’s best-known street food snacks: a fish sandwich made from the catch of the day. Finish your 2 days in Istanbul with a cruise on the Bosphorus. Depending on which company you use, the starting point will likely be located within a few hundred yards of the Galata Bridge. The finale of your 2 days in Istanbul deserves to be epic–and a cruise on the Bosphorus definitely lives up to those expectations! 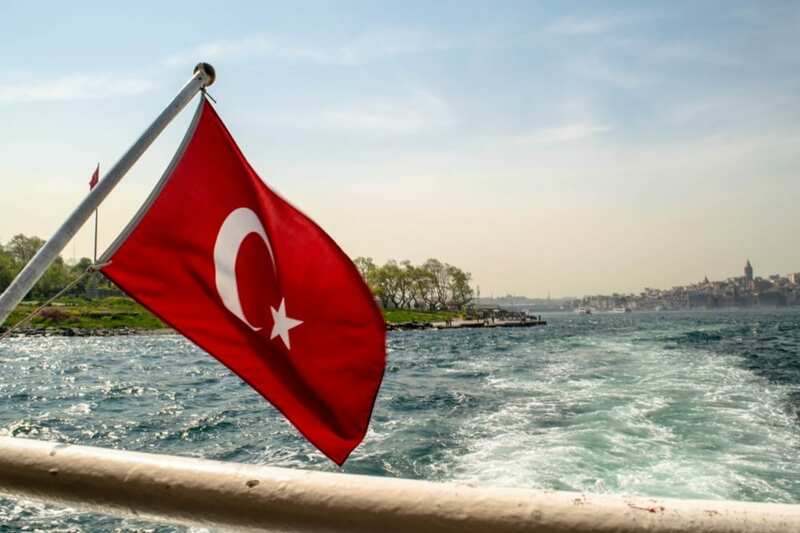 Enjoy sunset while cruising the Bosphorus Strait, eat a traditional Turkish dinner, watch some performances, and marvel at how you are straddling the line between Europe and Asia! 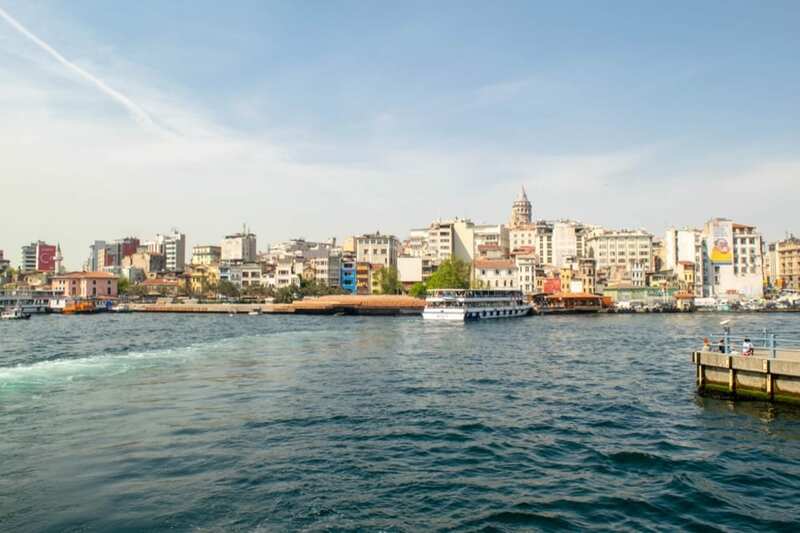 For a more budget option, you can also hop the ferry over to Kadikoy (a neighborhood on the Asian side of Istanbul)–you’ll find plenty of dinner options there, as well! This well-reviewed Bosphorus Cruise includes dinner, drinks, entertainment, and amazing views! Istanbul is positively bursting with things to do: you could live here for a year and not cover it all, so definitely don’t worry about getting bored if you’re lucky enough to have more than 2 days in Istanbul! With additional time, consider spending an afternoon in a Turkish hammam (spa), strolling along the former walls of Constantinople, taking a day trip to the Prince Islands, paying a visit to the Suleymaniye Mosque, heading over to Asia to check out the bustling neighborhood of Kadikoy, visiting the Valens Aqueduct, going to see the stunning Chora Church, or seeing a Whirling Dervish show. With more time, you could also consider going further afield in Turkey: short trips to Cappadocia or Ephesus are easy to take from Istanbul, either individually or as part of a tour. Istanbul is enormous. 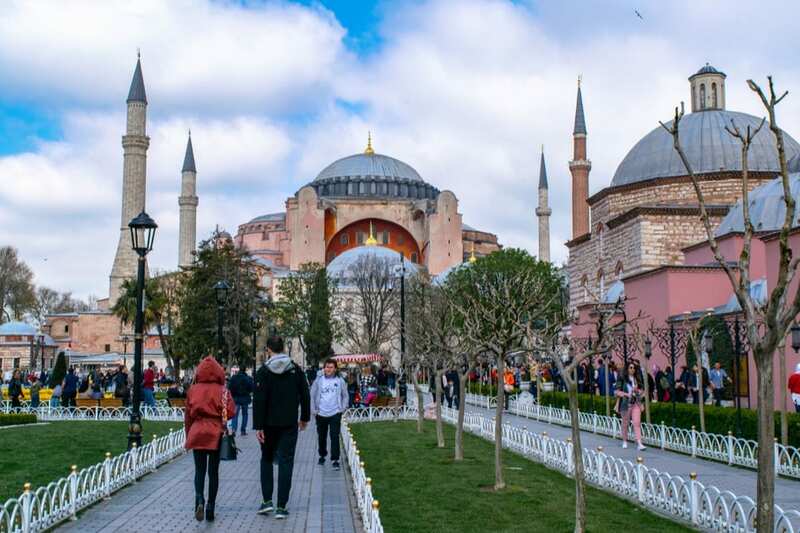 As the home of 15 million people spread across two continents, getting around Istanbul will require a bit more than walking from place to place (though we did structure this 2 days in Istanbul itinerary to allow as much walking as possible). Other than walking, here are some popular options for getting around Istanbul. Taxis are extremely common (and reasonably priced) in Istanbul, but the drivers do have a habit of trying to exploit tourists. The starting fare is 4 lira (watch the meter), and insist on using the meter wherever you go–odds are that you’ll get at least a few drivers trying to get you to agree to a set fare. This is our most common method of getting around Istanbul when we can’t walk. Uber is available in Istanbul, and prices are reasonable. We tend to hail an Uber if there aren’t any taxis around. Trams exist in some areas–with this 2 days in Istanbul itinerary, you may want to use one in Sultanahmet to get from Topkapi Palace to the Grand Bazaar, though you can also walk. The tram that runs down Istiklal is more of a tourist attraction than a source of transportation, but feel free to jump on if the mood strikes. Istanbul has an expansive and modern metro system–if you need to cover large distances and want a more affordable option than a taxi or Uber, the metro is a great choice–you can even take it between the continents! Riding the ferry between Europe and Asia on the Bosphorus Strait is a popular thing to do in Istanbul. 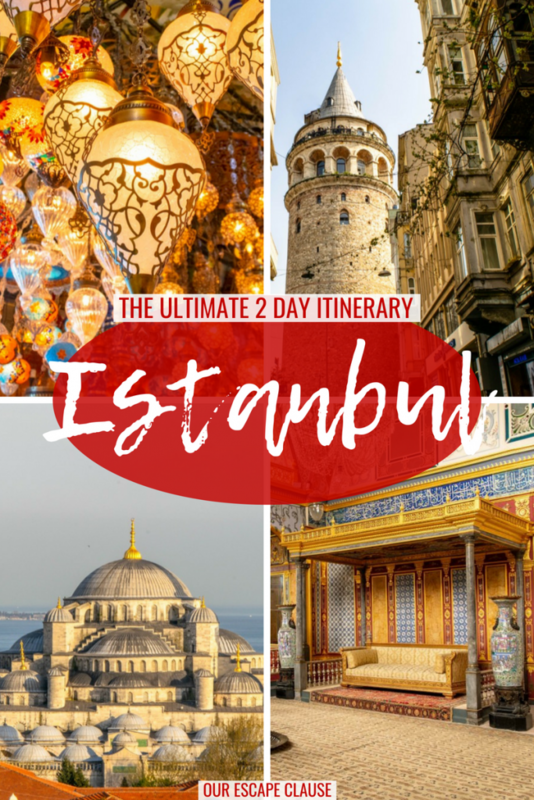 You likely won’t have time to do this with only 2 days in Istanbul, but if you have your heart set on it, it’s an option! Don’t rent a car in Istanbul. Istanbul’s traffic is notoriously terrible and its streets are generally packed–save yourself a headache and don’t even consider renting a car in Istanbul. Istanbul is the very definition of a multicultural city, and people’s wardrobes vary wildly: at any given point walking down Istiklal, you’ll be able to see women in abayas and women in miniskirts (at least in the summer, that is), and everything in between. I would say that for women, it’s most common during the summer to see women with either their knees or shoulders exposed, but not both (so wearing a short dress with a conservative neckline or a tank top with pants), but I feel perfectly fine walking around in my usual summer dresses that end above the knee are are usually tank top style. Istanbul is very fashionable–both the men and women tend to dress very intentionally, and heavy makeup on women is common–so if you like to dress up, this is definitely the place for it. In general, you should feel perfectly comfortable in whatever your normal wardrobe is while in the touristic parts of the city you’ll be visiting on this 2 days in Istanbul itinerary. The exception, of course, is visiting mosques, including the Blue Mosque. For visiting mosques, you’ll need to dress very conservatively. For men, this is simple: wear pants (no shorts) and a shirt that is not a tank top. In some more traditional mosques, men will need their arms covered as well, but the Blue Mosque doesn’t require it. For women, there are a few more things to think about: bring a scarf for your hair (some mosques have them, but better to come prepared), wear a long dress or skirt (a maxi is perfect here, if you wear pants they need to be loose and ideally covered by a long shirt/short dress), and cover your arms and chest. Unlike in some parts of the Muslim world, women don’t need to wear an abaya to enter, but you do need to plan your wardrobe ahead of time! Istanbul is working to shrug off a reputation as a somewhat dangerous city (and to be fair, the bombing near the Blue Mosque in 2016 did not help). But truthfully, we feel incredibly safe in Istanbul. This is a large, touristic city that is very used to having guests from all over the world and is well-prepared for them (even solo female Istanbul travelers!). The tourism infrastructure is solid, the people are some of the friendliest we’ve met anywhere in the world, and walking down the street is a breeze. While you do need to keep your wits about you just as you would in any large city, I feel just as safe here as in Rome or Paris (and frankly, people try to scam us less in Istanbul than in those cities). Before coming to Istanbul, we worried that it would feel like Morocco–overwhelming, and like everyone was after our money. 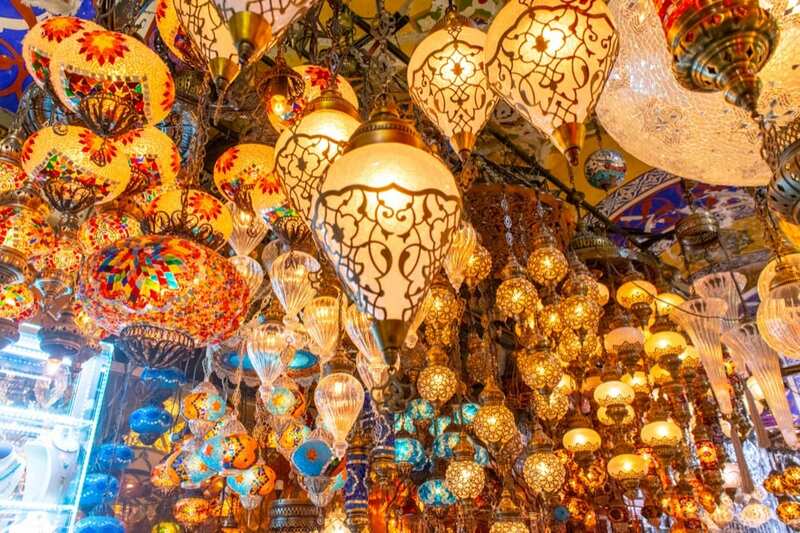 People are disconcertingly helpful (to the point where I have to turn off my suspicious traveler’s mind that knee-jerk avoids “helpful” people), and even the haggling in the Grand Bazaar is very tame to those of us who are used to haggling in markets in Asia and Latin America. 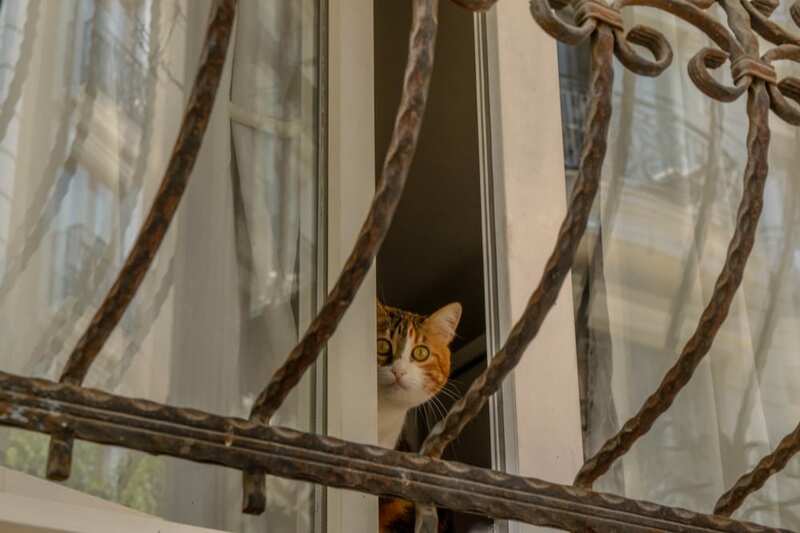 I understand the hesitation over coming to Istanbul–we had it, too, especially as that 2016 bombing I mentioned earlier happened at a point we had once been planning to be in the city–but most likely your concerns will evaporate upon arrival. Mosque-Appropriate Clothes — The Blue Mosque (and most other touristy mosques) have items available to borrow, but you’ll be more comfortable (and feel more prepared) if you just bring your own. — Keep worries at bay during your 2 days in Istanbul: store your belongings in a travel safe while you’re out and about. Ours comes with us everywhere these days. — If you’re coming from outside Europe, you’ll need adaptors for your electronics–Turkey uses standard European plugs and voltage. 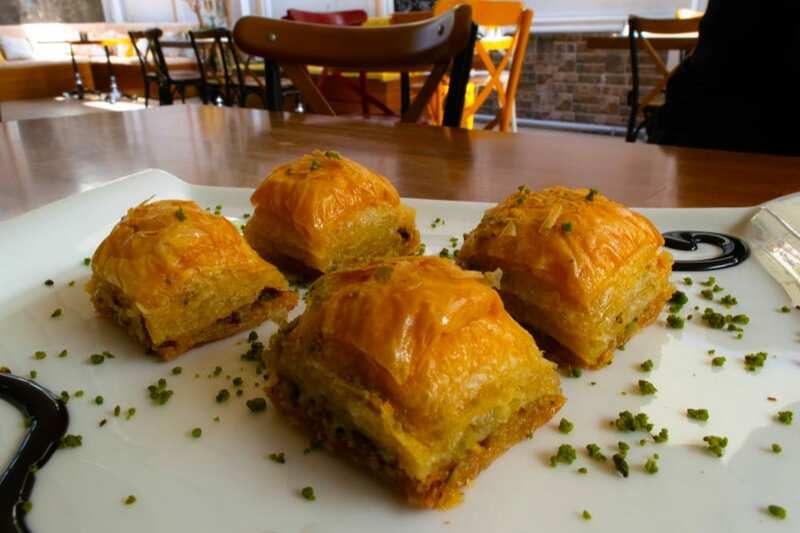 — All the better to eat baklava on the go with. , which is perfect for those of us who need something with a low time commitment. Comfortable Walking Shoes — Istanbul is built on several hills and this 2 day Istanbul itinerary requires lots of walking–save your feet and bring shoes that are easy to walk long distances in and are already broken in. There are dozens of neighborhoods in Istanbul, but for the purpose of 2 days in Istanbul, there are really two options to look at. 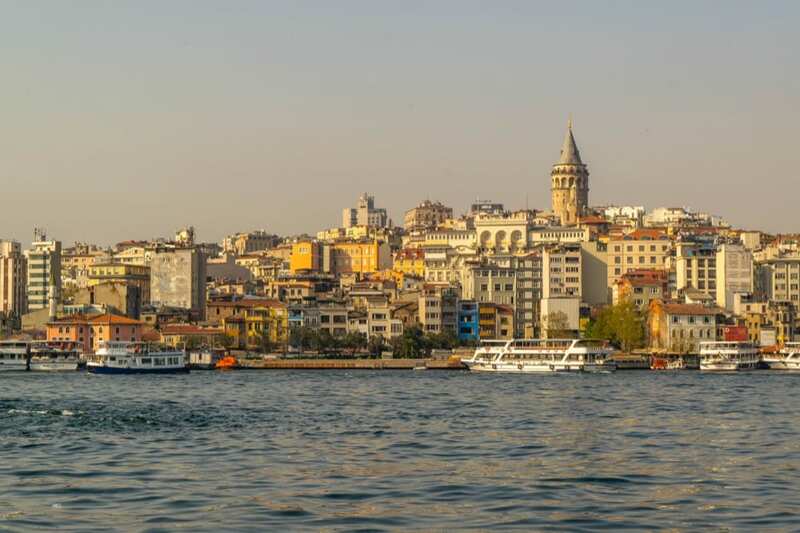 Option one: stay in Beyoglu (over by Taksim Square or the Galata Tower)–this is the more modern side of Istanbul, and there is more nightlife here. Option two: stay in Sultanahmet (near the Blue Mosque, Hagia Sophia, Topkapi Palace, etc)–this is the home of more of Istanbul’s classic sights, but it tends to be pretty dead after dark. There will be plenty of restaurants open, but they won’t be busy. 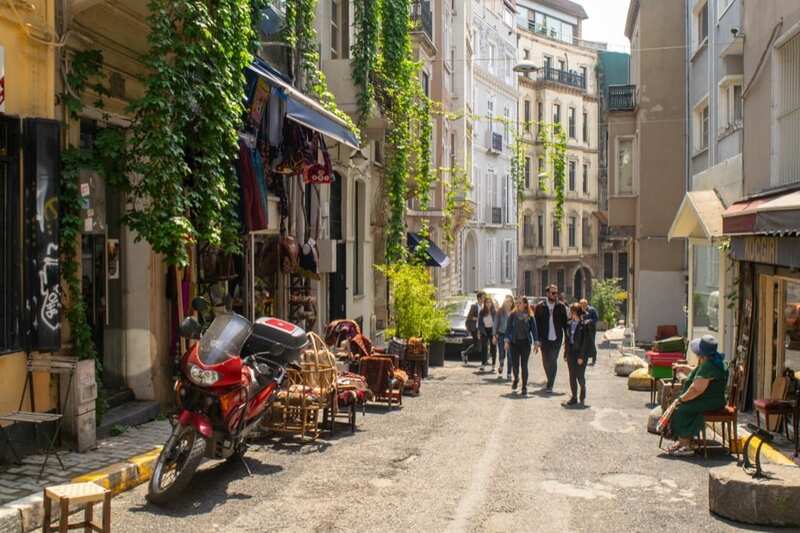 We’ve stayed on both sides twice, and tend to be of the opinion that Beyoglu is best for longer trips to Istanbul and Sultanahmet is better for shorter trips where you need to cover the major sights more quickly. For this 2 days in Istanbul itinerary, we’d recommend staying in Sultanahmet if nightlife isn’t a big deal to you, and Beyoglu if it is. We personally stayed in and enjoyed, both of these Sultanahmet hotels during our visits to Istanbul this year. Some super tips. I was over in Istanbul a while back but cannot remember that obelisk. Istanbul has so many stunning and unique sights and your itinerary is perfect for covering them! I also loved prince islands which you mention as a destination if you have more time. We’ve heard great things about the islands! Still need to make it out there ourselves. I’ve been wanting to go to Turkey for some time now, and your fabulous photos made me wish I was there now. What a terrific post full of great tips for when I get there. Would December be a good time to go? Turkey is one place I havnt been and I kept believe I havn’t gone there yet! I love the art of this part of the world, and omg, that food looks amazing! The food alone is worth the trip! I’m actually working on a post JUST about the food in the city. I had a very short amount of time to see the sights of Istanbul while there on a business trip a few years ago. Your gorgeous photos brought back a lot of amazing memories and made me feel good about all that I got to do and see with the time I had. The Hagia Sophia and a boat tour on the Bosphorus were definitely highlights for me! Definitely! This is an amazing city. Jeremy is in love with the views from the Bosphorus, it’s one of his favorite spots in Istanbul. We’re heading to Istanbul for 2 days with the family. This itinerary is so well laid out. We’re pretty much going to follow exactly:)Thank you for all the wonderful information! Thanks so much, Sam! I hope you guys have a wonderful trip!